Mountain Bike Helmet Camera Stabilisation Tips - Action Sports Videos. Stabilisation of the camera is important when making mountain bike helmet videos. Modern cameras are capable of excellent picture quality and resolution, but if the image shakes around too much this is not being used effectively. The aim is to make films that are appealing to ordinary people, as well as other off-road cycling enthusiasts. When watching films the typical viewer prefers a smooth experience, without sudden movements of the camera, jerkiness and vibrations. When mountain biking there are often many bumps, roots, rocks and compressions. The same forces that compress your suspension can cause the helmet camera to shake around. At best this causes an image vibration, and at worst the camera angle moves up and down rapidly. There are various tips and techniques you can use to improve the stability of your videos, without having to invest in expensive equipment. The sport already has a lot of technical gear associated with it. Using some freely available tips and methods is the best approach for most people. Once you have tried these, if you are still wanting a smoother image you can invest in a mechanical stabiliser system. Our head is the most stable part of our bodies when participating in action sports. Our brain does an excellent job of keeping it level, so that our eyes track the ground at the same angle. By mounting the camera to your helmet, you are taking advantage of this freely available advantage. A chest mount also works well, as your torso is isolated from the bumps to a large extent by movement in your legs and arms. We do not recommend mounting the camera to your bicycle handlebar, unless you are riding on relatively smooth trails such as dirt roads and cycle paths. Handlebar and other bike mounts are prone to picking up vibrations from the ground. Some technical trails may be challenging and fun to ride, but less suitable for mountain bike helmet videos. When the going gets rough and you are working hard to control the bike, this may not look as good on film as it did with your own eyes. You may enjoy watching the footage by yourself or with your riding friends as a record of your adventure, but the chances are your non-cycling friends will be put off. Instead you can plan the location in advance to select trails that are fast and flowing, but also relatively smooth. This helps ensure a balanced viewing experience and makes your films more watcheable. When watching a professional mountain biking movie, most of the footage is taken from the side of the trail. The helmet view is only used for some sections. These are normally quite short. Too much head footage can get boring for the viewer. Try to film from regular angles from the side of the trail, and include footage of the people you are riding with. Then add some head footage in as well, focussing on the most interesting sections. Having a friend riding in front of you adds a lot of interest, as well as using slow motion. Record the location where you are cycling, the scenery, people and other interesting things around it to make an introduction and overview. This helps to make your film more appealing to ordinary people. If you want to make films of rough trails, with rocks, bumps and jumps then a gimbal stabilizer gives more professional results. This is an mechanical stabilising system. It uses electronic sensors and fast moving brushless motors to react to movements and vibrations, keeping the actioncam locked at the same level. They are available in two-axis and three-axis configurations. The picture above shows a 2-axis wearable gimbal from Feiyu. 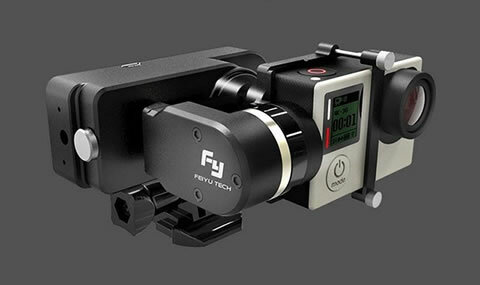 It is compatible with the GoPro mounting system, and can be easily mounted to a crash hat or chest mount. Two-axis stabilization gives good results for mountain biking, and the gimbal is less expensive than the 3-axis version. Gimbals are expensive, often costing more than the sports camcorder itself. The results are worthwhile if you are a serious filmaker, and want to make the most of the high resolution available with modern technology. We hope that these tips will help you make better, more interesting films.